by Alec Clayton – Romance blossoms at Barney’s Pub between Alex, a left-wing Democrat, and Jim, a Libertarian-leaning Republican – old friends from half a century ago. Meantime, someone is killing off all the old drag queens, and Jim may be the only person who can catch the killer. It’s early November 2008. The presidential election campaign is going hot and heavy. Alex Martin, an Obama supporter, and Jim Bright, wearing a Ron Paul button, meet in Barney’s Pub in Wetside, Washington. They were best friends when they were teenagers but haven’t seen each other in 50 years. Reunion at the Wetside is a love story between two unlikely lovers, and it is a different kind of murder mystery. Special note: There are so many characters in this book that a cast of characters was required, and the cast of characters alone is a wildly entertaining read. “If you like murder mysteries with a bit of meat and history on them, you will love Reunion at the Wetside.” – Jack Butler, Pulitzer Prize-nominated author of Living in Little Rock With Miss Little Rock. 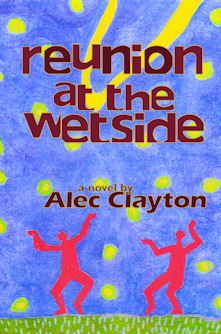 Order Reunion at the Wetside from your favorite bookstore or Amazon.com.